7:30PM on Monday, June 6, 2016 at the CSULA State Playhouse Theater. Admission FREE. Please submit form under “Youth Orchestra” and you will be contacted to arrange a time between mid June and mid August for your audition. All students ages 12 and up playing all orchestral instruments are welcome to try out. Violinist Chien-Tang Wang, Gold Medal Winner of the 2015 Osaka International Competition, will perform the Sibelius Violin Concerto with the orchestra on Sunday, June 5, 2016 at 3PM at the San Gabriel Mission Playhouse, 320 S Mission Drive, San Gabriel, CA 91778. Other works will include the World Premiere Performance of “Encircled” by Sharon Hurvitz, Violinists Angela Che and Jeongwon Claire An performing Sarasate’s Navarra for 2 Violins; as well as Tchaikovsky’s Swan Lake Suite. Admission FREE. 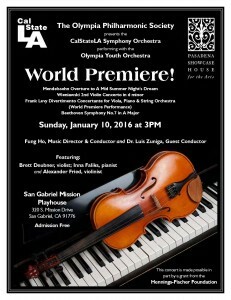 2nd of the Annual Admission Free Concert presented by the CalStateLA Symphony Orchestra/Olympia Youth Orchestra. 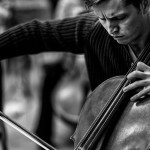 You are currently browsing the Olympia Philharmonic Society weblog archives for the Uncategorized category.